Rockchip Factory Tool is a small application that allows you to flash stock firmware on RockChip based smartphone and tablets. Here on this page we have shared all versions of Rockchip FactoryTool including the latest version. It allows you to flash stock firmware on any RockChip smartphone and Tablets including RK2918, RK3066, RK3188, RK312A and lots more. It comes with two options i.e Upgrade and Restore Option. You can choose them as per your need to flash the firmware. Rockchip FactoryTool is available in two languages i.e English and Chinese. You can choose the language by clicking on the Language Button anytime. Once you have added the Firmware on FactoryTool, then it automatically detects the Chip of the Firmware and thus allows you to know that firmware is compatible with your device or not. 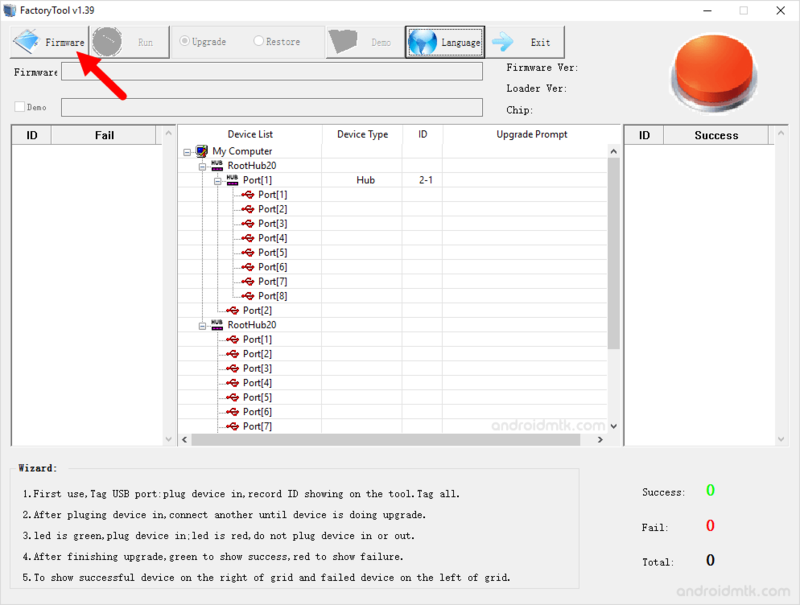 Whenever any RockChip Device is added to the Computer, FactoryTool automatically detects it and show them in the Device List. Beside this it also shows the Device Type, Device ID and the Upgrade Process during the flashing. [*] How to use: If you want to learn How to flash stock firmware using RockChip FactoryTool then head over to How to use RockChip FactoryTool. [*] It allows you to flash stock firmware on almost all type of RockChip Smartphone, Tablet and Feature Phones, including RK2918, RK3066, RK3188, RK312A and lots more. [*] Caution: During the Upgrade or Restore process on FactoryTool, your personal data will be deleted permanently. So, take a backup of your important data before using the tool. [*] Download RockChip Driver Assistant: If you are looking for the correct drivers that supports RockChip FactoryTool, then RockChip Driver Assistant is the best choice.